Gridlock, the popular Home screen liberator, is now available to download for iOS 7-powered iDevices and the iPhone 5s. Carrying a 2.0 label, the jailbreak tweak can be found in the Cydia Store for $4.99 or as a free update for previous Gridlock users. 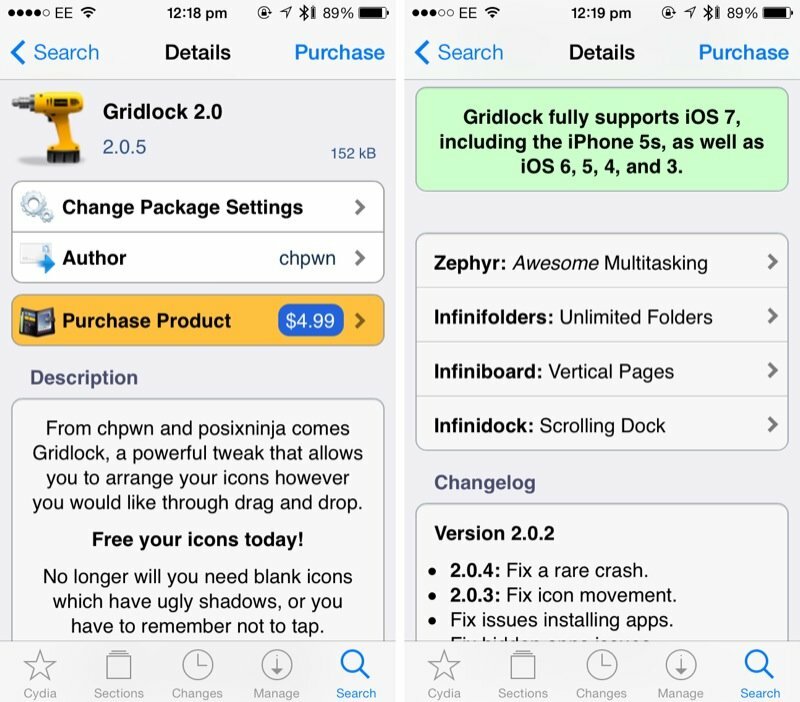 Developed by prominent iOS hackers @chpwn and @p0sixninja, Gridlock initially came to our attention back in 2010 when it first reached the Cydia Store. As we explained at the time, the jailbreak tweak allows users to place iOS app icons anywhere they like on their Home screen; by liberating jailbreakers of the iOS app grid, Gridlock makes it possible to place all apps on one side of the iPhone’s screen, for example, or in a customizable pattern. It’s easy to use, and has received regular performance-improving updates since the jailbreak tweak launched three years ago. From chpwn and p0sixninja comes Gridlock, a powerful tweak that allows you to arrange your icons however you would like through drag and drop. For iOS 7 and iPhone 5s users, Gridlock 2.0 brings full compatibility for the new mobile OS and Apple’s ARM64-iDevices. Plus, it does this while maintaining compatibility with older iterations of the iOS; as such, Gridlock 2.0 is compatible with iOS 7, iOS 6, iOS 5, iOS 4, and iOS 3. As mentioned, Gridlock 2.0 can be downloaded for $4.99 in the Cydia Store. For owners of the jailbreak tweak, however, the update is available to download free of charge. If you’ve jailbroken your iOS 7-powered iDevice, you may be interested in reading about Touchy, which allows iPhone 5s users to create iOS app shortcuts for individual fingerprints, or WinterBoard for iOS 7. Further recent additions to the Cydia Store also allow jailbreakers to improve Control Center, enhance Touch ID, and to even add a live Weather app icon to their iDevice. See also: On Track For A February Release, Running Quest Is An Endless RPG Runner For iOS, It’s About Time: Black Sabbath’s 1970s Albums Finally Reach The iTunes Store, and Roar Rampage Creator Releases Pixelated Puzzle Adventure Game Lost Yeti.